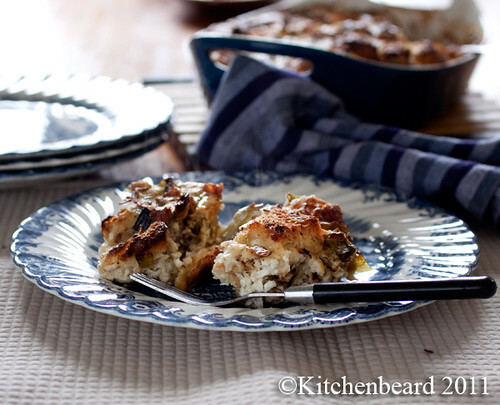 Cleaning Out the Fridge Bread Pudding, a photo by kitchenbeard on Flickr. It happens. You’ve been hitting the farmers markets and you’ve got left over bits filling up your fridge and you really don’t want to let them go to waste. This is where I found myself this week end. Two kinds of bread from Acme Bakery, leeks and herbs from the Castro farmers market, cheese from Rainbow Grocery, eggs from Golden Produce and left over duck fat from Marin Sun Farms all were crowding my fridge. I needed to use all this up somehow before it went bad. Individually I didn’t have enough for a meal and the bread had gone stale to the point that it could have been used as a weapon. Yet, if I used them together, I realized they would make a nice savory bread pudding to fill me up on a chilly and foggy San Francisco evening. The measurements in this recipe are guesses since I used what I had on hand. Use it as a template for your own left overs. This would also do well at brunch with the addition of browned sausage in place of the duck fat. 2)Mix herbs into cream and bring to a simmer. Remove form heat and allow to steep for 10 minutes. 3)Mix bread with cream and cottage cheese and set aside for 30 minutes. 4)Sautee leeks and garlic in duck far into just beginning to brown. Add to bread mixture. Mix in eggs and cheese. Allow to sit for another 10 minutes to allow bread to fully absorb liquid. 5)Butter a baking dish and pour in bread mixture. Place baking dish on baking sheet to catch any overflow. 6)Bake for 30 to 40 minutes until firm in the middle and a nice comes out almost clean. Allow to rest for 5 minutes before serving. Words, Food, Pictures. That's me.